Can't view the sign—it requires a Facebook login. I'm logged in and I can't see it either. Thanks, because I couldn't access the link either - and I AM a friend. Were you able to access it? Here's an Imgur rehost of the image in question, if anyone's still having trouble. I was able to access the second link. I was walking around a couple days ago, and noticed all the construction between 6 St SW and 4 St SW, south of Independence. Looks like they're installing an Eisenhower Memorial? I see on Street View, Maryland Ave SW (which used to run through there) once had a rare triple-lane yield where it met Independence (though two + parking most of the time). Not sure I've seen that anywhere else before. Anyone know if Maryland Ave was realigned between 6 and 4 St? Old satellite imagery seems to show an old alignment apparently re-purposed partly for parking. ^ Based on aerial imagery, the recent (pre-existing-construction) configuration dates back at least to 1964. While the parking area you're referring to is technically along the street line, it was an add-on that came after westbound Maryland was realigned to come directly off Independence. There was a time period in between where whatever former pavement existed in the parking area had been obliterated, then rebuilt as a new parking area before 1964. Thanks for the info! The way Maryland hits Independence on both sides of 4 St, definitely doesn't seem like a setup that would have been common after the 60s (large paved area, no signal control), so that all makes sense. As originally laid out (in L'enfant's day), MD-Ind-4 1/2 St was a 6-way intersection in a similar manner to PA-Constitution-4 1/2 St a few blocks to the north. In both cases, the streets were later simplified to avoid the 6-way intersection to simplify traffic patterns. For the northern intersection, Constiution was split into two parts with PA being the thru street and the northern section of 4th closed to traffic as part of Judiciary Square. For the southern intersection, Maryland was split into two parts in order to avoid all 3 streets coming together at the exact same intersection. At the time this was done, the transportation authority realized that due to the railroad and the capitol, there was very little thru traffic on MD, so some of the excess space in the roadway was relegated to parking. And now the've closed the whole block south of Independence altogether for the Ike memorial. A monument I didn't know about until this morning, courtesy of this thread. Thanks for the info. Those six-way intersections definitely worked back when L'Enfant designed them, as they mostly shuttled unorganized horses and people, not cars. I can certainly see why things were changed, especially since DC's lights are all timed, and a six-leg intersection would totally throw off the grid. I've spotted an issue with the Pennsylvania Ave PBL (so, an error that's been in place since around 2011). When the eastbound left turn signal is activated towards Constitution, the through signal on Pennsylvania is red, despite there not being any conflicting traffic or pedestrians. Because the cycle path uses through-traffic signals, the signal has to be red during the left turns because of the overlap with the cycle path. They could easily fix this by creating a conflict (i.e. adding a crosswalk on the east side of the intersection), or by adding a bike signal that can run independently. Either way, right now, it's a dumb design, and I've witnessed traffic ignoring the red signal on many occasions (and I can't blame them as there is no conflict). 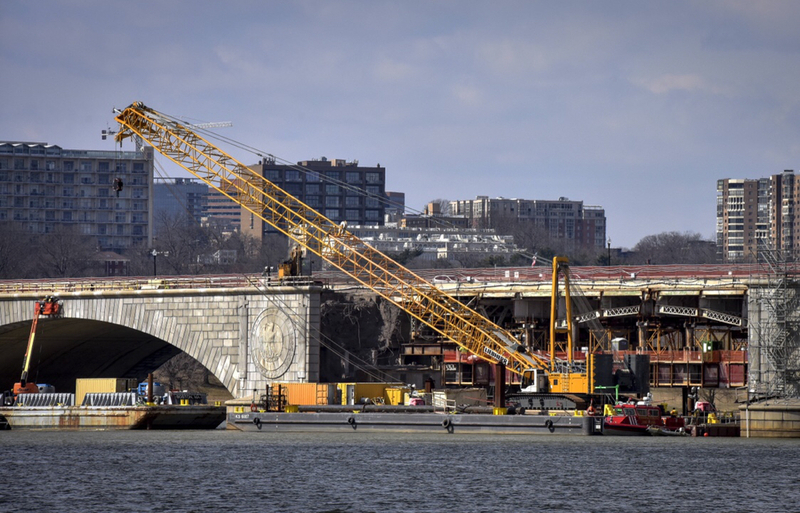 I haven’t been able to get a picture of the Memorial Bridge work, but this ran on the Post’s website this afternoon. It’s interesting to see the draw span structure. Driving over it is a miserable experience right now, though, as is getting to the bridge from Virginia due to lane-closure-related merges. Is is still a reversible three-lane setup? Was like that back in January, but I won't be back in DC for a couple weeks. I keenly remember the lanes being uncomfortably narrow. It was as of Washington’s Birthday. I assume it still is. I haven’t been over it since said holiday. All of these are accurate except when i was there, the middle Lane didn't look very reversible. Thanks. Judging by the schedule I see online (now), it should be in place on the north, and then south side of the bridge, until 2021. I had thought the draw-span bits had been removed already. Glad I got to drive over it (regularly) before refurbishment, though some of the metal plates in the road (placed during summer time, I think) definitely made it a bumpy ride. It would help if other drivers didn't slightly wander into it. I mean, instead of reversible signals over each lane, they had signs hanging with painted arrows and Xs. For all I know they manually flip them every day, but they looked not like that was a thing. I see. Interesting. I know of a couple reversible lanes in DC that operate manually, but the Mem Bridge already had digital signage. AFAIK, none of the other reversible setups within DC use red X's and green arrows on overhead. Instead, there are signs that are posted with the restriction and the hours that are posted. There are occasional electronic signs that are posted, along the lines of "DO NOT ENTER", "NO LEFT TURN", "USE 3 LANES". But these aren't nearly as precise. And IMO, it is downright dangerous around the times when lanes switch over as we can't assume that every driver has the right time. I've repeatedly noticed very dangerous behavior of cars driving on the wrong lane around 6:30 PM on many of these streets, and in particular along Connecticut Ave. There are reversible setups along Colesville and Georgia Ave in Silver Spring with electronic red X's and green arrows, but that is in MD, even though it is only about a mile north of the city. In the afternoon, yeah. It's one-way northbound west of that traffic light during the afternoon rush hour and it's easier for thru traffic to move left there because the right lane is blocked by sawhorses to facilitate the merge coming from Memorial Bridge. I have to admire the amount of efforts that the NPS does to implement reversible lanes on Rock Creek Parkway and Canal Road. But these are very labor intensive, requiring crews to change signs and put up barricades 4 times a day. But it does keep traffic flowing. I am perhaps more surprised that an electronic method of closing the road hasn't yet been implemented. Don't ask me how to do that, but if these one-way systems are so important to traffic, you'd think they'd find a way to get them to operate more like a regular road. Which is to say, with more autonomy. They also move sawhorses and cones around on the other side of Memorial Bridge, or at least they do when it's not under construction. 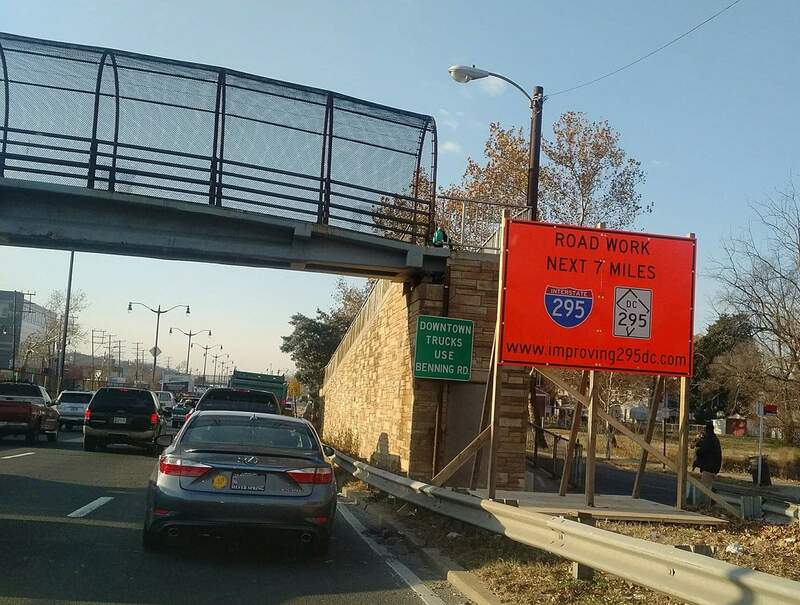 The idea is that during the morning rush hour people coming up VA-27 (and its extension to the bridge) are forced to go over the bridge rather than locking up the circle at the yield signs. One big problem is, the tour bus drivers think the barriers don't apply to them: I've seen bus drivers stop their buses to get out and move the sawhorses, or alternatively they just drive over the orange cones, in order to go around the circle to Arlington Cemetery instead of going over the bridge as the barriers are intended to require them to do. Then once the sawhorses and cones are out of place (because the bus drivers refuse to put them back), other drivers think they're entitled to go that way too. I think part of it is the nps wants to keep a rustic feel to the parkways. It may also explain the lack of signals at major intersections, like at I-66 at independence. I do see that stop sign going southbound towards Ohio Drive from I-66[/size]...I'm guessing that's the one you're talking about? I don't think I've bothered to notice that before. I almost always access the District via the Memorial Bridge. One big problem is, the tour bus drivers think the barriers don't apply to them: I've seen bus drivers stop their buses to get out and move the sawhorses, or alternatively they just drive over the orange cones, in order to go around the circle to Arlington Cemetery instead of going over the bridge as the barriers are intended to require them to do. Then once the sawhorses and cones are out of place (because the bus drivers refuse to put them back), other drivers think they're entitled to go that way too. This sounds entirely plausible, based on what I've seen! I don't drive much during rush hour, but the sawhorses have thrown me off a couple times at Memorial Circle, but mostly because I don't much go through there when they're normally up.